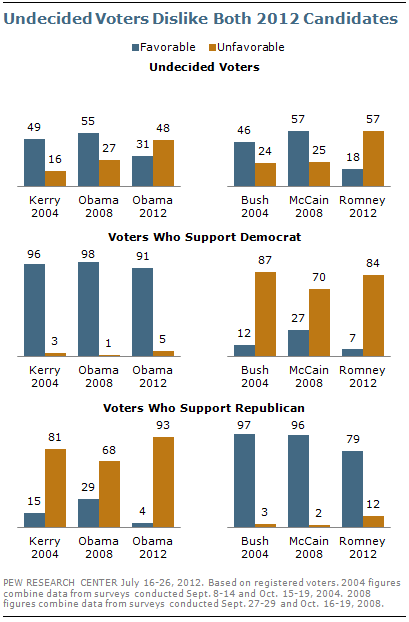 Track voter preferences for Obama vs. Romney overall and by demographic group. 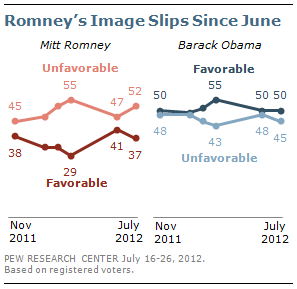 By a 52% to 37% margin, more voters say they have an unfavorable than favorable view of Mitt Romney. The poll, conducted prior to Romney’s recent overseas trip, represents the sixth consecutive survey over the past nine months in which his image has been in negative territory. While Romney’s personal favorability improved substantially between March and June – as Republican voters rallied behind him after the primary season ended– his image has again slipped over the past month. Barack Obama’s image remains, by comparison, more positive – 50% offer a favorable assessment of the president, 45% an unfavorable one. 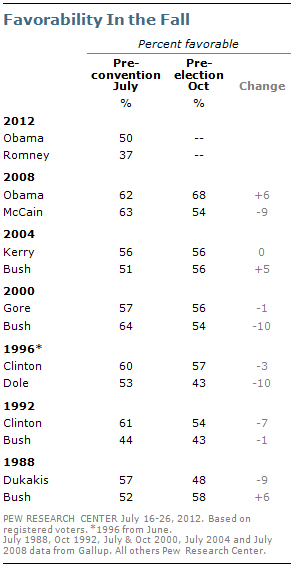 Even so, Obama’s personal ratings are lower than most presidential candidates in recent elections. A review of final pre-election surveys of voters since 1988 finds that all candidates enjoyed considerably higher personal ratings going into the final days of their campaigns than does Mitt Romney currently. In fact, only three, Michael Dukakis in 1988, George H.W. Bush in 1992 and Bob Dole in 1996, were not rated favorably by a majority of voters. 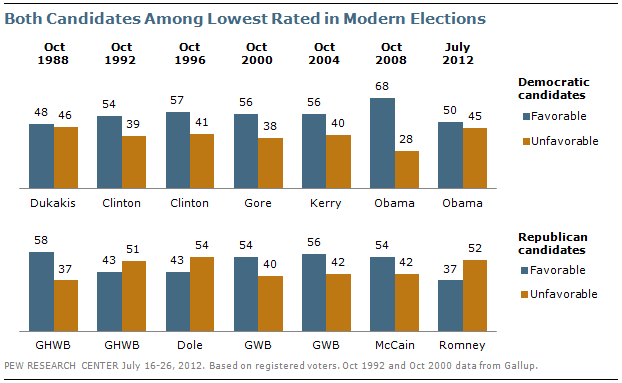 Obama’s current ratings also are lower than the pre-election ratings of most other recent presidential candidates. The latest national survey by the Pew Research Center for the People & the Press, conducted July 16-26, 2012, among 2,508 adults, including 1,956 registered voters, finds that, in keeping with his favorability advantage, Obama continues to hold a sizable lead over Romney in the election contest. 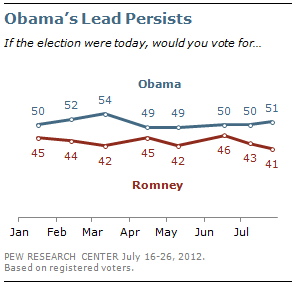 Currently, 51% say they support Obama or lean toward him, while 41% support or lean toward Romney. This is largely unchanged from earlier in July and consistent with polling over the course of this year. Across eight Pew Research Center surveys since January, Obama has led Romney by between four and 12 percentage points. To track the presidential race over time – among all voters and among key voting blocs – see our new election interactive. 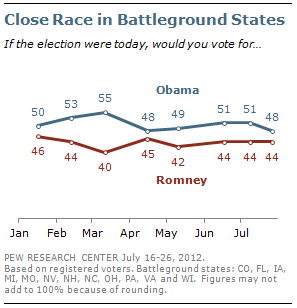 Obama holds only a four-point edge (48% to 44%) across 12 of this year’s key battleground states. While the data does not allow a state-by-state analysis, the overall balance of support in these closely contested states has remained level in recent months, with Obama slightly ahead, but neither candidate holding a significant advantage. The relative stability of this race can be seen within most voting blocs as well. Whites have consistently favored Romney over Obama, while minority support for Obama has held relatively steady. As has been the case all year, women favor Obama by a wide margin; currently 56% of women support Obama, while 37% back Romney. Men are more evenly divided (46% Obama, 47% Romney). Obama’s support among voters under 30 remains strong (58% vs. 34% for Romney in the current survey), while voters 65 and older are divided (49% Romney vs. 45% Obama). The battle for independent voters remains tight. The current survey finds that 45% of independents back Romney and 43% Obama, which is virtually unchanged from earlier in July. Over the course of the year, independent support has wavered, with neither candidate holding a consistent advantage. Both candidates have nearly universal backing within their party: Nine-in-ten Democrats support Obama and an identical share of Republicans support Romney. Obama’s overall edge at this point is based on the healthy advantage in overall party identification that Democrats have enjoyed in recent years. Currently, slightly more voters have a favorable (50%) than unfavorable (45%) opinion of Barack Obama. Though there are still more than three months to go before the election, Obama’s current favorability ratings compare poorly with the final pre-election ratings for previous Democratic candidates. Not since Michael Dukakis in 1988 has a Democratic candidate gone into the election with favorability ratings as low as Obama’s are today. Romney faces a more daunting challenge, as more voters say they have an unfavorable (52%) than favorable (37%) opinion of him. The only prior presidential candidates to be viewed negatively going into the election were George H.W. Bush in October 1992 and Bob Dole in October 1996.
to fall. In 1992, Bill Clinton came out of the Democratic primaries with relatively poor favorability ratings, which improved in the run-up to the Democratic Convention in July. Clinton’s ratings slipped in October, but remained in positive territory. But favorable ratings for some presidential candidates declined as the election approached. In 1996, Bob Dole’s favorability fell from 53% to 43% between June and October. And in July 1988, 57% of voters viewed Michael Dukakis favorably. That declined to 48% in October of that year. 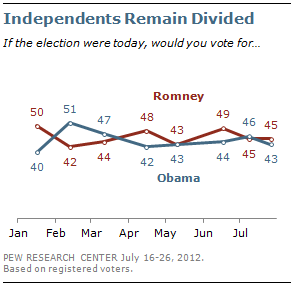 In the new survey, 7% of registered voters say they don’t favor or lean toward Obama or Romney at this point. Neither candidate is particularly appealing to these undecided voters: More hold an unfavorable opinion of Romney than a favorable opinion by a 57% to 18% margin. And only about a third (31%) of undecided voters view Obama favorably. This stands in stark contrast to the fall of 2008 and 2004, when undecided voters, on balance, liked both the major party candidates. Based on surveys conducted in September and October of 2008, both Obama and John McCain were viewed more favorably than unfavorably by at least two-to-one margins. The lack of enthusiasm for the 2012 candidates reaches beyond undecided voters. 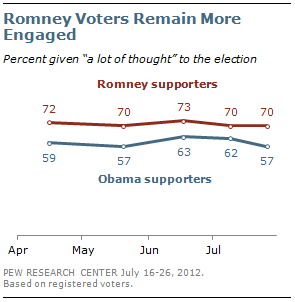 Currently, 79% of Romney voters have a favorable impression of him, while 12% report an unfavorable impression. This compares with an overwhelming 97% favorability rating for George W. Bush among his supporters in the fall of 2004 and a 96% favorable rating for McCain among his supporters in the fall of 2008. Even more notable is the overwhelmingly unfavorable opinion that voters have of the candidate they are voting against. Fully 93% of Romney supporters say they have an unfavorable opinion of Barack Obama. By comparison, in the fall of 2008 just 68% of McCain voters offered an unfavorable opinion of Obama, while 29% viewed him favorably. This pattern also is seen among Obama supporters: 84% view Romney unfavorably, compared with 70% who expressed an unfavorable opinion of McCain the fall of 2008.